The RemoveDebris mission, which started in 2013 and has more than 60 people assigned to the mission, draws on the expertise of some of Europe’s most prominent space companies and institutions. The project is co-funded by the European Commission and the partners (the research leading to these results has received funding from the European Union Seventh Framework Programme (FP7/2007-2013) under grant agreement n°607099). 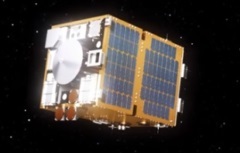 The mission will launch a 100 kg satellite (designed by Surrey Satellite Technology Limited – SSTL, and Surrey Satellite Technology US LLC – SST-US) to demonstrate four different debris removal technologies. In the mission, CubeSats, provided by the Surrey Space Centre (SSC), will be ejected from CubeSat deployers (provided by ISIS – Innovative Solutions In Space) to be used as “artificial debris”. Airbus DS France is in charge of the mission design and the system engineering. In the two capture experiments a net (developed by Airbus DS Bremen) is fired at a CubeSat to demonstrate net capture in space, and a harpoon (developed by Airbus DS Stevenage) is fired at a deployable target plate to demonstrate safe grappling in orbit, without generating additional debris. The third experiment involves vision-based navigation (developed by Airbus DS Toulouse and Inria) which aims to demonstrate rendezvous navigation using cameras and a LiDaR (provided by CSEM). Finally, the mission will demonstrate de-orbiting using a large dragsail (produced by SSC). All parts of the mission will rapidly de-orbit, and thus will not contribute to space debris. The RemoveDebris consortium has just finalised signing a launch contract with NanoRacks, a commercial company offering launch opportunities and satellite deployment services from the International Space Station (ISS), targeting a June 2017 launch. NanoRacks is able to offer this Space Station opportunity via the company’s Space Act Agreement with NASA’s U.S. National Labs. The unconventional launch sequence will involve the satellites on the Kaber platform being launched in a box to the ISS on-board an ISS cargo resupply mission, being unpacked by astronauts on the ISS then being attached to a slide table in the Japanese experiment module (JEM), finally being deployed into space. The RemoveDebris mission should be the first of many active debris removal missions, and is a vital prerequisite to achieving the ultimate goal of a cleaner Earth orbital environment. The RemoveDebris mission is being presented at the 67th International Astronautical Congress (IAC) in Guadalajara, Mexico from 26th to 30th September, 2016. The IAC is one of the largest space conferences in world and this year has attendees from 74 countries.